Ireland was fondly nicknamed “The Isle of Saints and Scholars.” While Europe was in the Dark Ages, Ireland was bathed in light and that is how they earned their nickname. There are over 130 Saints that have come from or lived in Ireland over the centuries. Many of whom have left volumes of important literature on living the Catholic faith. The faith of the Irish people is very strong, as they held onto and grew their faith in even the most trying times, as the large number of saints from such a small island attests too. There can still be found many of the churches, monasteries, seminaries, schools, and many other places of worship where our beautiful Catholic faith can be found, some over a thousand years old! 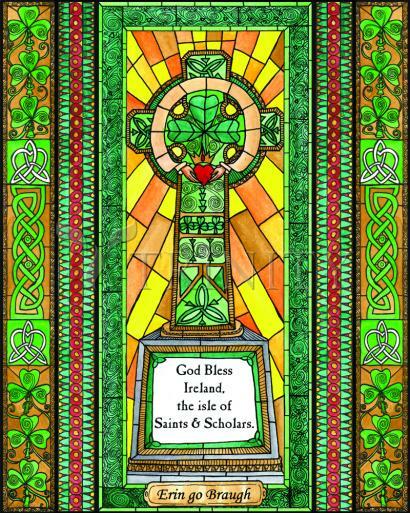 It is a common saying that on Saint Patrick's day we are all Irish, it is perhaps that we wish to be part of a strong and Catholic faith filled community! Celtic Crosses dot hundreds of cemeteries across Ireland and Scotland, as well as Wales, England, Europe, and beyond. Few symbols are as recognizable as the Celtic Cross as the embodiment of Celtic Christianity. It is popularly believed that St. Patrick introduced the Celtic Cross in Ireland, during his conversion of the kings from paganism to Christianity. Some also believe it was St. Columba or St. Declan who introduced it. Other theories site construction strength to the design – the circle strengthened the cross beams, preventing breakage or destruction by the elements or time. While the Celtic Cross is certainly a Christian symbol, it has its roots in ancient pagan beliefs at the same time. The stone circle at Calanais, on the Isle of Lewis in Scotland, is formed in a rough circle, with an even-armed cross within it. This is believed to be a sun symbol to the creators of the stone circle, which became a sacred shape to the Celts. St Patrick is said to have taken this ancient sun symbol and extended one of the lengths to form a melding of the Christian Cross and the sun symbol, and thus the birth of the Celtic Cross. The even-armed cross within a circle has been ascribed many meanings by many groups and cultures. One such meaning is that of the stages of the day: morning, noon, evening, midnight. Another possibility includes the meeting places of the divine energy, of self, nature, wisdom and divinity. Of course, obvious relations such as east, north, south and west; or earth, air, water and fire can also be derived from the shape. Even the Native Americans used this as a symbol for their Medicine Wheel. The sun wheel has also been called Odin’s Cross, a symbol in Norse Mythology. The early Gnostic Christians in Egypt also used a similar form for their Coptic Cross. It had the cruciform within a circle, a longer lower arm, and then a cross under the circle, similar to an ankh. The current form of Presbyterian cross is also a Celtic Cross, with flared ends of each of the arms. Original Celtic Crosses were not carved out of the rock – they were inscribed on the rock, such as the cross marker near Gallerus Oratory in Ireland. It is a slab of stone, erected and carved with a Celtic Cross on the surface. Another example is the Edderton Cross Slab in Scotland, made of red sandstone. The Killaghtee Cross in Dunkineely, Ireland is another fine example, dating from around 650 CE. It is thought this latter example marks the transition from flat grave slabs to the upright Celtic crosses. The top of the carving is a Maltese cross with the triple knot of St. Brigit underneath, representing the Holy Trinity. High Crosses were popular in the 8th, 9th and 10th centuries in Ireland, and were often built to memorialize famous people or places. Over time, they started sporting elaborate carvings, sometimes telling biblical stories. A famous cross at Clonmacnoise, Ireland is called the Cross of the Scriptures, or King Flann’s Cross. It is decorated with images from the bible, such as the Last Supper, the Crucifixion and the Guarding of the Tomb. This tendency towards elaborate story telling through sculpture could be an imitation of Roman sculptures such as Trajan’s Column, or perhaps the much closer Pictish carvings in Scotland. While many of the stylized designs on the Pictish stones are as yet a mystery, some obviously tell stories of battles and events. While there are many high crosses throughout Ireland, the majority of Celtic Crosses you will see are those for gravestones, a result of a fashion around the 1850s to use them as headstones or monuments. This is the style that has crossed oceans and taken root wherever Irish or Scottish immigrants landed, be it the Americas, far off Australia or New Zealand, bringing with them the beauty and mystery of the Celtic Cross.